Well, these type of situations can be handled easily by using reliable repairing tool, one like Remo Repair Outlook. Remo Outlook Repair program is highly recomended when you want to fix PST when Outlook PST backup file is not working due to some annoying reasons. This prominent PST fixing tool has been imposed with lots of beneficial and remarkable features, which makes it the most renowned PST repairing utility among industrial people as well as common users. It is specially designed with the most advanced algorithm with which it scans and repairs the corrupt or your damaged PST backup file within very short notice. Remo Repair Outlook has been recommended as the fastest PST file repairing software till today’s date and doing so, it never compromises with the accuracy of the result. This dynamic program supports different versions of Windows operating system including Windows 8.1, Windows 8, Windows 7, Windows Vista, Windows XP, Windows server 2008 and 2003 in order to perform PST backup file not working fix. It easily repairs Outlook backup PST files that are created on various versions of Outlook application including Outlook 2000, 2003, 2007, and 2010, even if it gets damaged or corrupted in a severe manner. This finest wizard not only repairs the corrupt or damaged Outlook PST file but also recovers all its attributes such as Mails, Contacts, Notes, Calendar Entries, Attachments and many more while fixing the backed up PST file. Remo Outlook Repair application also fixes PST file that is damaged or corrupted by various issues such as malware infection, application failure, Outlook up gradation, header corruption etc. that too with utmost ease. This proficient tool always comes with the preliminary version which is very helpful for analyzing the capability of the app before going for the purchase of real package. Similarly, for any query regarding product and its usage, you will get help for 24/7 from the technical support team. Step 1: Download Remo Repair Outlook tool and install the same on your system. 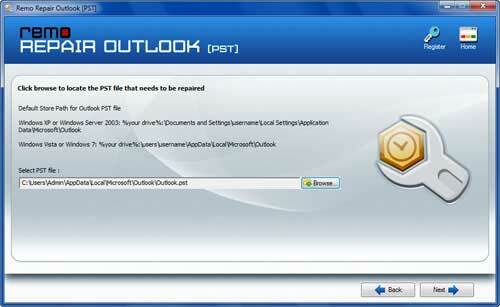 Then, launch the app and initialize the Outlook PST file repairing process. Here, you’ll find three options from the main screen i.e. 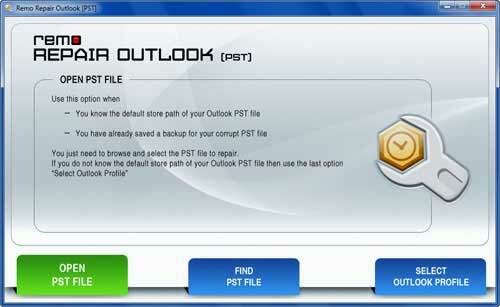 “Open PST File”, “Find PST File” and “Select Outlook Profile”. Click on “Open PST File” button to select the PST file to be repaired, if you know the exact location. Choose “Find PST File” button to locate your PST file or click on “Select Outlook Profile” to select a particular Outlook profile, if you have multiple accounts with multiple .pst files. Step 2: Select the appropriate scanning option to scan the file. Finally, browse for the destination path and click on “Repair” button to start the fixing of PST file. 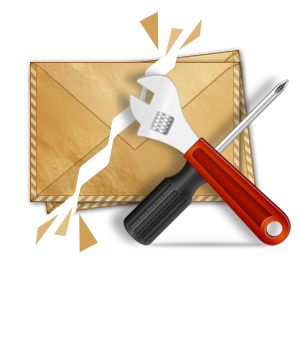 Step 3: After the tool repairs the file successfully, it displays the fixed file along with Outlook emails and other elements like calendars, contacts, tasks, journals, notes etc. or you can go for "Preview" option to view the same.